Boeing announced its plan to fly commercial planes via artificial intelligence algorithms without human intervention. The US giant aircraft manufacturer gave some insight about its bold plans at Paris Air Show. “In order to be able to fly all these new aircraft, you need 617,000 new pilots in the coming years, but the problem is that so many new pilots are not in the pipeline, now and in the foreseeable future” said Mike Sinnett, Boeing’s vice president of product development. So, Boeing is considering how to use the technique to at least partially remedy this deficiency. “We have to make aircraft operated by less experienced pilots safer,” says Sinnett. 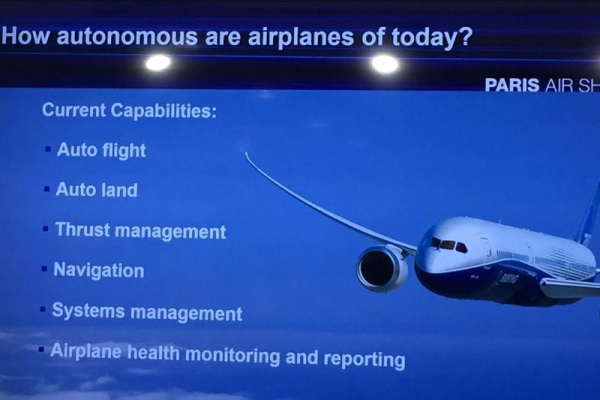 To achieve this, commercial aircraft will be even more autonomous than before, where the computer can already take over the flight, landing, thrust, navigation and other areas. While there are already self-propelled cars and other autonomous means of transport, they are not currently working on the same level of security as commercial traffic jets. “This is why we need to improve safety,” explains Sinnett. As the first new sub-areas for the autonomy of airplanes, he sees the push-back and taxiing on the ground. “We need visual sensors on board, a camera system and the data from TCAS and ADS-B,” says the Boeing manager, so that the autonomous taxiing could be a reality in one to two years. 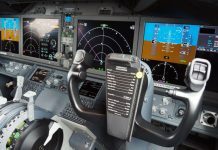 The manufacturer has now announced that a Boeing 777 will be used as a demonstrator in the spring of 2018, followed by a 787 again in 2019, which are to test autonomous flight control algorithms.